A strong cohesive working relationship, an essential part of the process, is developed between client and our team in order to create a beautiful and unique home tailored to the clients needs. I'm a Calgary based interior decorator. I believe spaces should look effortless, timeless and be a direct reflection of the people that live in them. Everyone has an inherently unique design sense. Sometimes it just takes a little encouragement and editing to fully realize that idea. This is where my role comes into play. As a self-taught Calgary interior decorator, I'm happy to meet you wherever you are. Whether you have a very developed sense of style, have no idea where to start or are somewhere in between. I can help create the space of your dreams from a completely blank canvas and take you from step A to Z, or work with what you already have and bring your space to the next level. Above all else, I promise our journey together will be collaborative, insightful and fun! Calgary Premier Full Service Interior Designer – 2X Best of Houzz! Pasche Designs is committed to enhancing and transforming your home by way of thoughtful and inspired design concepts that reflect your personality and lifestyle. Brenda has over 29 years of experience in interior design with both renovations and new construction. Her work has included residential, office spaces, retail and restaurants. 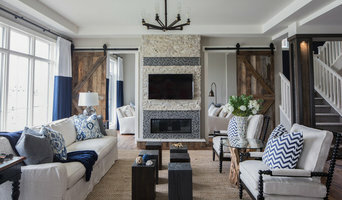 She brings a passion to the integration of architectural features, millwork and custom designed furniture to create environments that reflect each clients' unique personality and lifestyle. Brenda works with architects at the conceptual stage - designing architectural elements for the interior and detailed working drawings - to hands-on monitoring of construction and finishing detail. Her approach to design and construction combines sensitivity and professionalism in award-winning designs that have helped her build long-term relationships with clients that span decades. Calgary's Skilled Home Stager & Designer | Best of Houzz 2016-2018! A re-designed room can enhance your living space and give you a whole new appreciation for the beauty and functionality of your existing furniture! For over three decades, Cricklewood Interiors has delivered fun and exciting shopping experiences for those seeking unique furnishings, accessories, art, and décor. Sylvia Daoust, 11 Time Award Winner, is one of Calgary’s only design professionals with expertise in small spaces and project planning. Niche gives clients comfort leading projects with the utmost care and attention to detail. Sylvia’s commitment to the process, timeline and budget establishes a positive working relationship with not only homeowners, but some of the best independent tradespeople she works alongside. We promise a simple process, short timeline, solid quote, exceptional ideas you can afford and a project plan you will love. A streamlined space for simpler working and living is Niche reDesign's primary goal! Calgary's Renovation Expert and Designer! Premise Design is a small, down-to-earth, boutique interior design firm in Calgary, AB. Intentionally small because getting to know you is important, which means very personal service. Lindsay O. Creative Interior Design is a full service Boutique Design studio in Calgary, AB. We service clients in Calgary, Airdrie, Olds, Bearspaw, Cochrane, and Okotoks. We specialize in residential, hospitality and commercial design. Our residential team focuses on small and large scale renovations, new builds, furniture selection and color concepts. Our commercial portfolio includes a variety of projects ranging from start up restaurants and trade show booths to large office spaces and retail stores. Our best projects develop as a result of a collaborative relationship with our Clients. We are inspired by our Clients and the problems that they present to us and we inspire our Clients through the unique design solutions we create. Our mantra is to increase the value, functionality and flow of each space we design and we ensure that our Clients have fun and enjoy the process as much as we do. Services: We are a team of university educated interior designers with a skill set that extends beyond space planning, furniture selection and color concepts. We are also skilled with producing full construction drawing packages, 3D colored renderings and exterior design. Please visit our website, instagram page, Facebook to keep up with what we're working on. At Mackey Design Group, we strive to design timeless yet contemporary spaces that suit our clients’ personality, lifestyle, and vision. We work collaboratively with our clients to achieve thoughtful, innovative, holistic and creative solutions and we aim to pay close attention to every detail to ensure all of our clients needs are met. From small design details to large-scale visioning, we are passionate about our work and invite you to contact us for more information on how we can assist you with your interior design and architectural needs. We look forward to hearing from you! CVK is a design company involved with residential and commercial interior design in Calgary, Alberta. CVK maximizes the potential of functionality and flow of your space and helps to awaken your style ensuing comfort whether in a contemporary or traditional setting. With services ranging from colour consults and space planning to full renovations CVK has gained clients from Calgary, Montreal, Toronto, Chicago, Solana Beach, CA and Kelowna. The work of a professional can make all the difference. Whether your home has 10 bedrooms, or your apartment is 800 square feet, it can be tricky to create a cohesive look that is representative of your style. That's where a local Indus interior designer comes in. A home decorator will help distill your tastes and ideas into a design that suits the needs of your space. Whether you need help creating a functional space plan, rearranging existing pieces, designing the inside of a new home, or simply sourcing amazing furniture and decor, seeking the help of professional interior designers and decorators in Indus, AB is a must. A good home design professional will hone your style down to its very essence and be able to choose a functional layout that feels natural to you. Interior design companies can be involved as much or as little as the client desires. 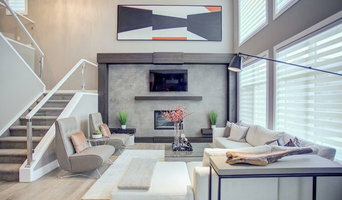 Many clients who hire an interior decorator in Indus, AB — particularly those who are remodeling — have a good sense of how the room should look and what products they should use. Often clients will insist that interior decorators use the products already present in the house. Other times a designer will need to start from scratch — especially if this is a newly purchased or just-built home. An interior design company will need to figure out exactly what the client needs, which includes organizing rooms, picking flooring and wall colors, and finding furniture to complement it all. Sometimes that means he or she will have to recruit help from other Indus, AB home professionals to help create the perfect look for your renovation. Here are some related professionals and vendors to complement the work of interior designers & decorators: Architects & Building Designers, General Contractors, Home Builders, Design-Build Firms, Photographers. Do your research before meeting with an interior designer or home decorator in Indus, AB. Ask yourself what you want your space to become and what it will be used for. Figure out the extent of what you need help with, what your must-haves are and what your budget is. Interior design services can add up fast, so be up front with a potential design firm or individual from the beginning. Also, pick an interior decorator that fits your style. Browse through the portfolios of different Indus interior design firms and decide if you would live in those houses. Just because you like something doesn’t mean you could live in it. There's a big difference! Find an interior designer or home decorator in Indus, AB on Houzz. Narrow your search in the Professionals section to find Indus interior designers near you. You can also look through Indus, AB photos to find a room you like, then contact the design firm who designed it.